We've blogged before here at Cuthberts about the VTech Toot Toot Drivers range which is still really popular with customers. Last year we featured the Toot Toot Drivers Airport and now we're looking at the Fire Station which was released by VTech in 2012. The Fire Station consists of a main building unit with an entrance gate that lifts up when a vehicle approaches. There is also a slide piece which connects on the side, allowing a fire engine to make a quick getaway when there's an emergency. The Fire Station has two different volume settings that can be found on a slider switch on the front. On top there is a light up siren which can also be twisted round. There is a music button on the front panel, and also a fire extinguisher button. One the side on a fire hose which can be turned, much as you would a real fire hose. When any of these buttons are pressed the station responds with music or one of several phrases. When playing any of these the siren light on top flashes. The Fire Station does not come with a Toot Toot vehicle, but these are available separately. In the entrance way of the Fire Station there are special detectors so that the station recognises which Toot Toot Drivers vehicle has driven in to the Fire Station and it greets it by name. We've even put together a video review and demonstration for you. The Toot Toot Drivers range continues to be popular with pre-schoolers, especially as the chunky cars and track are perfect for little hands. All the buttons to press on the Fire Station and the interactive way in which it greets vehicles also mean that it's ideal to hold children's attention and keep them busy. 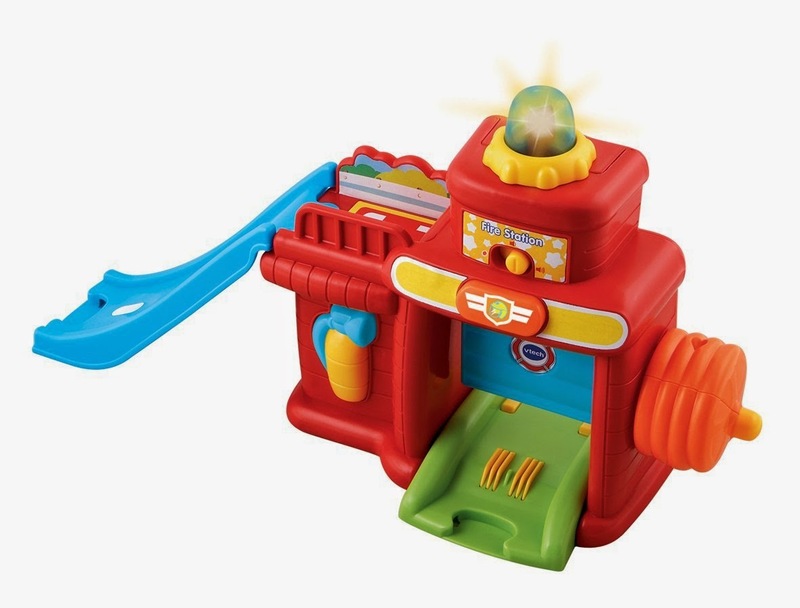 The Fire Station connects to all other parts of the VTech Toot Toot Drivers range and any of the vehicles can be used with it. The VTech Toot Toot Drivers Fire Station is available online here and also in store (St Albans, Letchworth and Hatfield Galleria) along with the rest of the Toot Toot Drivers range.